Former Texas Gov. Rick Perry announced Friday he is suspending his presidential campaign, making him the first Republican candidate to end his 2016 White House bid. 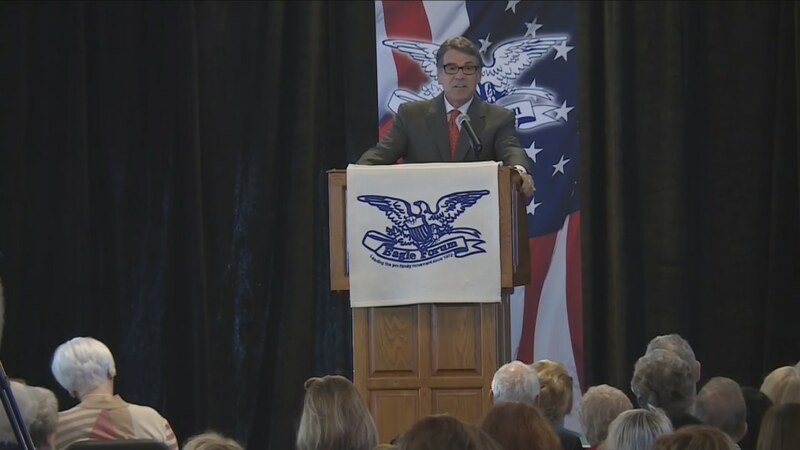 “We have a tremendous field of candidates, probably the greatest group of men and women," Perry went on. "I step aside knowing our party is in great hands." Perry's struggling campaign failed to gain momentum in the crowded GOP field. A CNN/ORC poll released this week found Perry getting less than one percent support from Republican voters nationally. Rival candidates were quick to thank Perry for his public service. Perry entered the 2016 race after waging a disappointing effort four years earlier. He began the 2012 presidential race with much fanfare, touting impressive fundraising numbers and a record of explosive job growth during his tenure as the governor of Texas. But he stumbled badly in early debates, alienating many conservatives when he suggested that those who do not support in-state tuition for the children of undocumented immigrants "don't have a heart." Already flagging in the polls, in a CNBC debate, Perry famously forgot the third of three agencies he'd vowed to gut, uttering a helpless "oops." Perry worked after leaving the 2012 race - and the governor's office - to restore his image, studying foreign policy and donning new black-rimmed glasses in preparation for another run. But his former campaign woes haunted him in a race filled with new options and voters hungry for change. “I give you this news with no regrets,” Perry said Friday. “It has been a privilege for me, it has been an honor to travel this country to speak with the American people about their hopes and their dreams."